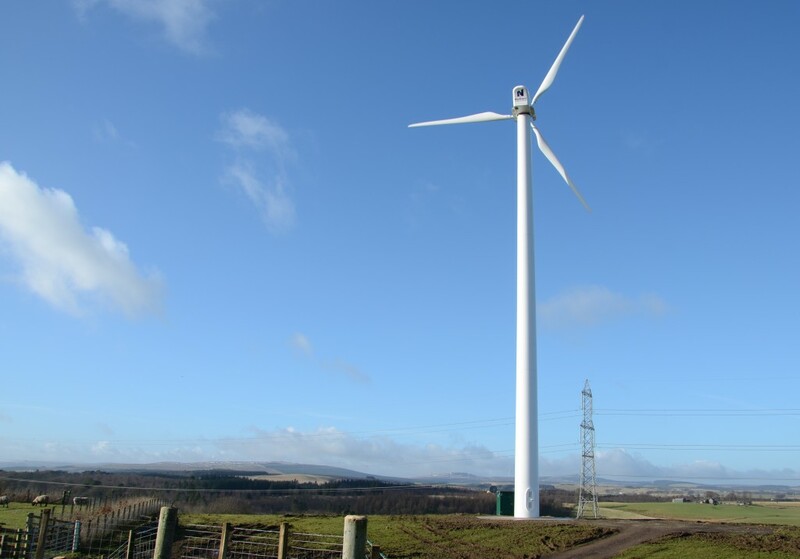 Our customer approached us having achieved all the planning permissions required for the installation of his 100kW Northern power Systems wind turbine. The local DNO (Distribution Network Operator) however would not allow the generator to be connected to the grid, as the section of network was already saturated with generation from a large wind turbine nearby. Our customer’s turbine installation, already well underway and having had significant investment could not simply be scrapped. The solution is to install a 100kW EMMA System, which limits or completely stops power being exported to the grid. This will mean that the wind turbine can be installed, and can still produce power for the farm AND generate income from the feed in tariff, without any payment required to the DNO. The system was designed in collaboration with Coolpower Products, the manufacturer of the EMMA. The EMMA was set up to feed the available power,which would normally be exported, to a load bank. 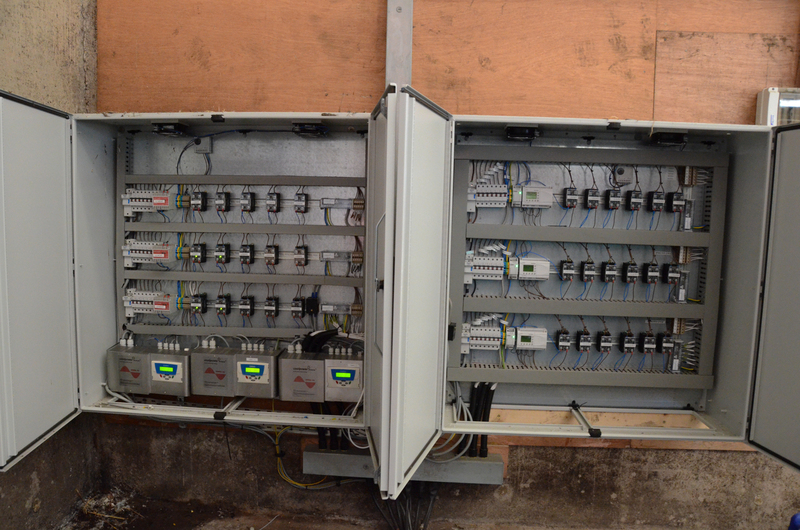 In this case, the customer was able to install a large water tank containing several 3kW immersion heaters. This tank is now heated from the wind turbine power and is used, via a heat exchanger, to run a large dryer system which is used on the farm. The Northern Power Systems (NPS) 100kW Wind Turbine was installed by local company 3R Energy Solutions. As main dealer of NPS Wind Turbines they provided support for ensuring EMMA system was tailored to suit the turbine. The system saves our customer large amounts of power usually used to run the dryer system. Drying of woodchip provides a cost saving and potentially income from sales of the dried product. We provided complete support for installing the EMMA electrical system, from ground up and to the stage of commissioning. The complex wiring work took 7 days to complete. As well as saving large amounts of power with the wind turbine, the EMMA system ensures that the wind turbine can always remain connected to the national grid, but never exporting power. 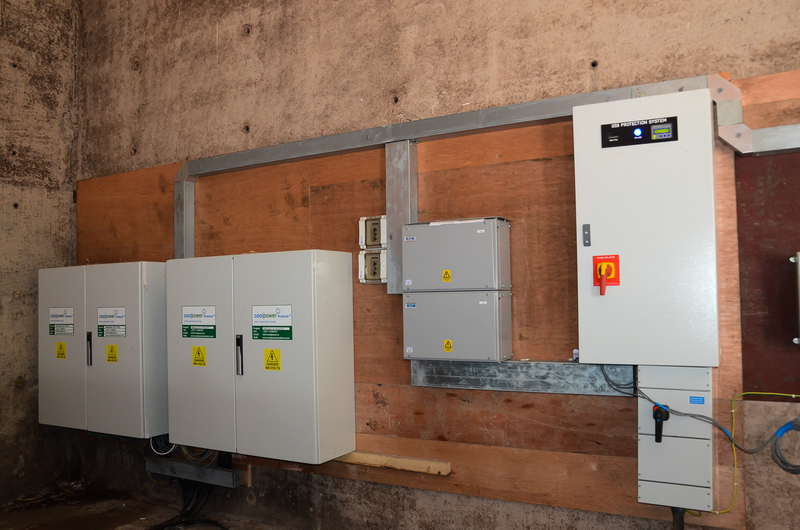 This ensures maximum yield from the feed in tariff. Without EMMA, the project would have had to be scrapped after significant investment of time and money due to the no export restriction on the grid connection.